** We do not prescribe Opioids at our practice ** Dr. Jason Litt brings extensive experience to his role as an anesthesiologist and pain management specialist at Precision Orthopedics and Sports Medicine. He serves patients at Laurel, Gaithersburg, and Oxon Hill, MD, by collaborating with highly qualified and experienced staff, who strive to provide the best medical care. Board certified by the American Board of Anesthesiology, Dr. Litt pursued his medical education at Rutgers, the State University of New Jersey. 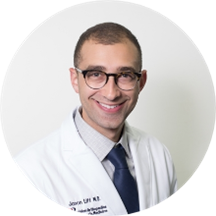 He completed a residency in anesthesiology at the Mount Sinai Hospital and further went on to complete a pain management fellowship at the University of Virginia. Dr. Litt’s emphasis has always been to stay current with the advancements in medicine along with their application. He ensures that his patients are receiving the most modern anesthesia techniques available keeping in mind the patients’ safety and comfort as their chief priority. A personalized plan is developed for every patient so that they received specialized care at every stage of the procedure. This is my 2nd visit with Dr. Litt. Again, he has made a wonderful impression on me. I asked him multiple questions about my issue and my future with these problems, and what options we have. He listened to everything Ihad to say/ask, and answered everything. Told me some options I have, and some I didn’t know about. He validated completely my feelings and my concerns about my future in dealing with my issues and treatment options. He is a true breath of fresh air. It has been a long time, or maybe the only time a doctor has made me feel encouraged. Thank you so much Dr. Litt. I recommend you to anyone!! Dr. Litt took the time to read the medical records I brought with me. When he came in my room, he was aware of my problems and previous treatments I had received. We discussed together the options available to me, andmade some decisions. He was very pleasant and understanding. It was really wonderful to have a doctor who listened to, and discussed with me, what we could do today and what we need to plan for. I highly recommend him. Good, but he recommended that I see a different doctor for my problem. So, I did not get the help that I need. Dr. Litt was fantastic and the office staff are wonderful as well. Dr. Litt made sure to address all of my concerns and made sure to outline a plan for me. I’ve struggled for year to get doctors to take meseriously and finally I’ve found one that is. 10/10 would highly recommend. Dr. Litt and his staff are truly amazing! I felt welcomed even before I walked into my appointment. Dr. Litt took his time to listen to my concerns and came up with a game plan after carefully assessing the situation. Iwas mightily impressed with his all around professionalism and am looking forward to my next visit. This was a very good doctor who took his time with me. He didn't rush and answered all my questions and was very knowledgeable about my disease. Not too many doctors around with his knowledge and skills to help with mylife disease.Very glad to have found him. He's up to date and very informative. Pretty efficient. Took time and was a pleasure. All the staff was friendly.